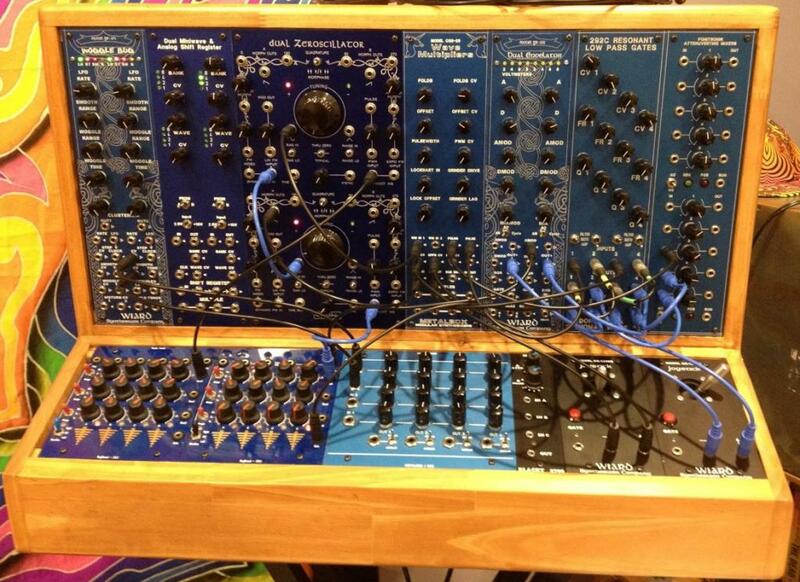 I’ve been vacillating on what modular system/format to choose for a while now (Buchla? Serge? 5U? Euro? Frac? Ect…). All the recent Wiard forum posts now have me seriously considering putting together a Wiard system over the next few years. I had mistakenly assumed they were out of production! I really like the build quality, sound, aesthetics, and the fact that it would probably be around and working in 30 years or so when I retire. I’ll probably start with a module or two and work my way up to all 7 that are currently offered (311c, 321, 331, 341, 352, 361, 371). I’d like to contact a local woodworker (or maybe Scentury Cedar) to build a case for me, in the style that I’ve seen with the 311c on the bottom, in it’s own angled slot. A case and power are necessary so why not start with the case I’d like to finish with. For the case I’m just wondering if I should if I should just plan for 6 modules above the 311c? Or hope to find a WFC used (7 modules above the 311c)? Or even leave room for some Wiard 300 compatible modules (I’ve read that Slow Riot is working on a line), some Hinton matrix modules, doubles of existing Wiard modules or potential future Wiard modules? Would a 12 module upper with two 311c’s on the bottom be too ambitious? Would there need to be rails on the back for a Hinton power supply? Or could this be mounted inside? Also, I would have no idea how to convey the specifications to the luthier, especially if they aren’t experienced in building custom rack furniture. Sorry for all the questions, I’m just in the planning stage right now. Any opinions and advice to get me headed in the right direction would be greatly appreciated!!! Hi Smokey! Welcome to the Wiard forum. For the case I’m just wondering if I should if I should just plan for 6 modules above the 311c? One of each may not be enough. Perhaps you'd want at least two VCOs, if not three, ultimately, depending upon what you want to do with the system...also, I've got some new modules in the pipeline, which I can't comment on quite yet, but you'll be hearing about them soon. A row of 3U is a also a great idea. Hinton modules are a lovely companion to the Wiard 300. Personally, I prefer to keep cases in 19" rack widths. It makes them easier to transport than something massive, and makes it easier to mount other things with your modules. So, I'd suggest something modular, like two 19" width sections. Having some full width rack mounting space at the front can be useful for all kinds of things, even if you only have one 311C. Making the front sections 3U is another suggestion, for flexibility, and then you can mount a 1U utility panel above the controller. Would there need to be rails on the back for a Hinton power supply? 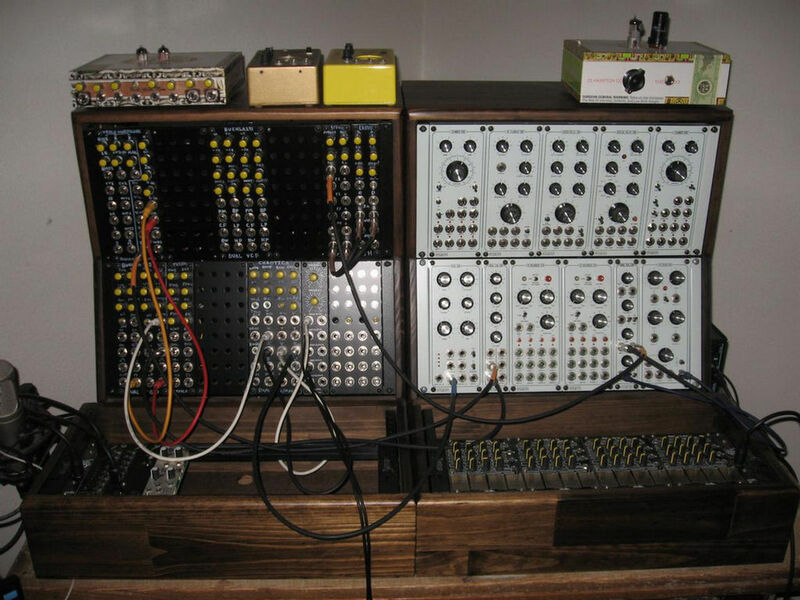 Maybe try working with someone who builds synthesizer cases already? Where are you located? I think the design aim is for the modules to outlive the user. It sounds like you have a specific goal in mind. My personal experience has been to avoid custom solutions towards cases and to use off the shelf Gator cases that I can change around, but they do not have the same aesthetic appeal, that's for sure. Given that you are not too sure of your final system, that may be valid in your situation, and then perhaps once you have settled on your perfect configuration, that may be the appropriate time to call in the woodworker. The Hinton mixing range is very important in my set up, I couldn't live without one. I wouldn't say I'm working on a line, I am working very slowly on very specific devices to fit in with the W300s. The first is based on the functionality of the Waveform City, although quite a different implementation. Excellent idea on a row of 3U. Hinton’s mixing range is very interesting to me. Yes, I see you point about transport. Perhaps two cases with 19” rack widths would be more reasonable for me. That way I could start with one case and expand when the time comes. Having a 311c + 3U front section is a great idea. I’m located in Southern California and I love Goike’s designs. Unfortunately, it seems he is too slammed to do custom work. Lamond’s work is also beautiful. Yes, perhaps I should just go with a simple Gator case to start that I could later replace with a custom wood case. Very reasonable idea. Excellent! I look forward to seeing and hearing what you design. Thanks carygrace and slow_riot! You’ve given me some great advice and a lot to think about. Much much appreciated! David at Nice-Racks built my custom wood cabinets and they are beautiful...but I was not smart enough to stick to 19" luggables and have this gigantic beast as a result. It still fits into my car though so I'm good, provided I can get someone to help me pick it up at both ends of the trip. A row of 3U somewhere in the system lets you add in brilliant supplemental modules like the Hinton stuff, Blacet Binary Zone, Metalbox Gated Comparator...there is no good reason not to do it. I know I have been beating this drum for years, but if you have an 8 step sequencer with ANY mind of mod input-- the octave or select input on a Sequantizer, or an inhibit or direction input on a metalbox Sequential Switch-- and you add a Binary Zone, you no longer have an 8 step sequencer, you have a 64 step sequencer. 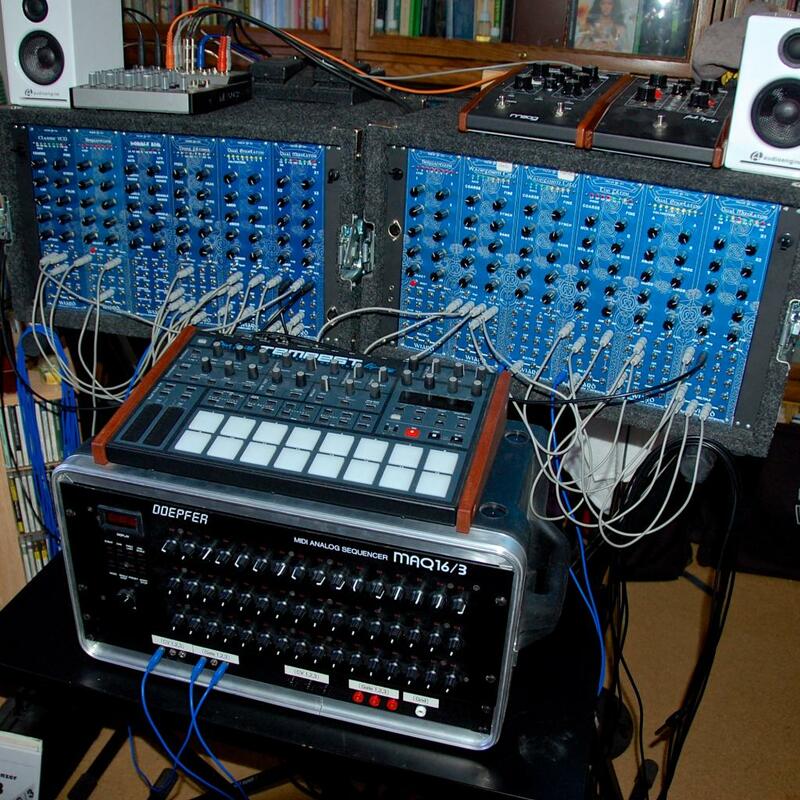 I would find a portable rack case that is 14U tall, that way you could do 2 rows of 6 300 series modules across then the 2U controller at the very bottom and it would still be space efficient, maybe not tall wise but width wise and it would be nice! Nice Racks has always seemed like a nice, affordable, wood case solution. Great idea. Also, thanks for all the 3U suggestions. A 14U case filled with the blue stuff might be a little heavy if I were trying to be portable but you make a good point about space efficiency. I also tried Thomann's much cheaper in-house plastic cases of the same size and look: http://www.thomann.de/gb/thomann_rack_case_12u.htm , but returned two (!) of them as they were too wobbly to even just stand on the ground with all four feet. I appreciate this type of case for their extremely light weight, solid carrying handles and easy to attach covers (with enough depth for the knobs and even for cables!). All of this translates to easy transportability, even with patches intact as long as they don't go across both cases. The downside is that it's 12U, not 14. Even though I left the backs open above and beneath the Hinton PSU, in the one unit that's currently maxed out (6U of 300 series, 4U blue Milton sequencer, 2U original 311 controller) the space above the PCB enclosures gets quite warm. The other case lost some 3U modules last year so ventilation isn't a problem. and keep the SKB cases just for transport. I mean, Wiard/ Hinton already provide for quick & easy rack mounting with their custom 6U frames, so why not take advantage of that flexibility and use no-compromise solutions for the various installation situations! Back in the day Grant even sold Elpac wall warts and power cable looms with the modules for even more flexibility. I'm told these are not advised today anymore, just goes to show how much thought has been put into ease of use at Wiard HQs from the start on. Second this. A matching set of custom cases will look awesome together. Though if transporting it with any regularity is actually in the plans, give some thought to the angled bit. Such layouts are ideal for studio use, but can make for a more cumbersome shape to pack and huff around. 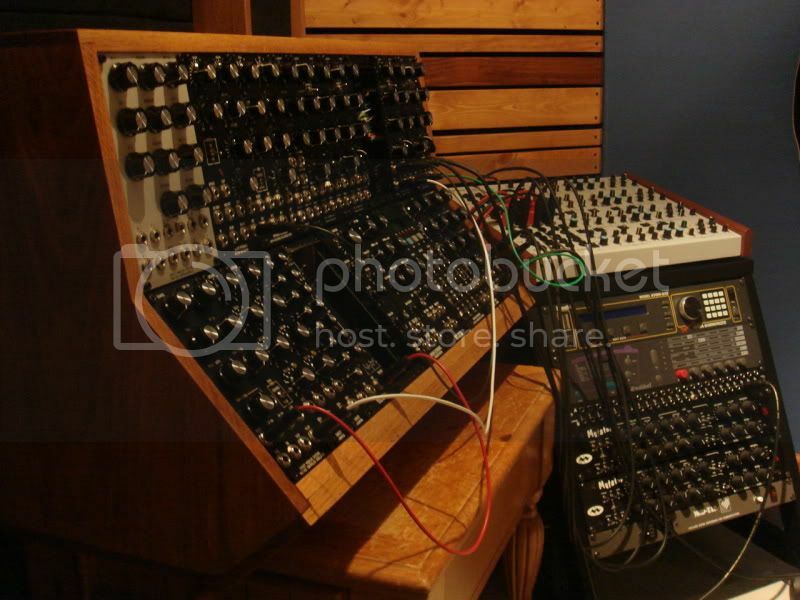 VCS3 v. Synthi. One possible idea if you want ease of transport, but still want your control surfaces in a comfortable place is to have a separate skiff for a controller. 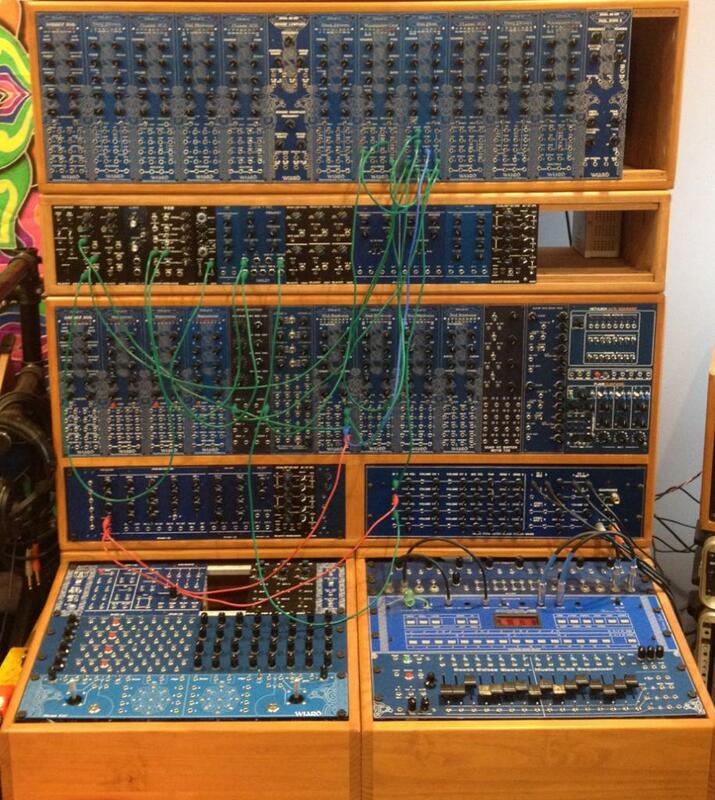 You could, but the 300 modules are really meant to be placed in horizontal rows with all the jacks at the bottom. This way the patch cables stay out of the way of the knobs. I heartily recommend Nice-Racks. I would only go elsewhere if I required hard wood rather than pine. I use Grundorf road cases. They are rugged. Would the 311c fit in a Gator or SKB case's lid, depth-wise. That might be a nice, portable skif. Hmm, I need to give my Gator another look. Not quite. The 311C is slightly over 2" deep. Plus the space in the lid is usually needed to accommodate knobs and things that protrude from panels. I wonder if a mixer case might be adaptable to the purpose, maybe with a mixer on top and 311C below it? I don't have a specific one in mind - just had the idea. One good thing about keeping to 19" rack format is the ability to easily mix and match other gear (audio and processing) with your modular in the same cases. Beautiful! Are these a custom design? I'd love two cases; one with a row of 6U on horizontal upper, 3U on the angled lower, and a skiff in front with either 2U or 5U. Two smaller cases would be pretty portable if needed. When I'd like to expand, I could just duplicate the two cases. Great setup! Awesome setup as well. It seems like it would be very fun to command. Those cases do look very rugged. David from Nice Racks may also provide the highest level of customer service I have ever seen. He stands behind his work 100%, down to the color of the wood stains. Quite amazing plord! You've got this Wiard game figured out! The Nice Racks looking excellent once more. My advice would be to decide on what modules you want and how many before going too deeply into the issue of cases. You might find as you start using modules your view of the final system changes. I started with 7 modules but then expanded to a 13 module system. One option I have not seen mentioned is taking this opportunity to learn a little wood working. If you are starting with a module or two this should give you plenty of time to come up with some ideas, make cardboard mockups, and refine a design that is right for you. Plus you learn a skill out of the experience. The cost was pretty minimal outside of time. And if you ever want / need a new case you can sell the old one and build another. Lovely case bf. I really should learn a bit of woodworking. So, now I'm thinking about starting with a simple 6 unit case and expand into my grand case idea after a few years when I really know what I want. As Wiard 300 modules mount on top and bottom, any tips would be great! just quoting this, cus, well... yeah. How deep are 300 series modules? If I were having a case made, how much depth should it have for both the modules and a Hinton power supply? My modules are 210mm depth, with an enclosure that is almost the same height as the module.